WIND energy producers now have a year’s respite to comply with a government directive to accurately forecast their electricity supply to a power grid. An accurate forecast helps prevent demand-supply imbalances in a grid and reduces burden on states and power generators who have to make arrangements for last moment demands. An amendment to the Indian Electricity Grid Code (IEGC) regulations last April had required wind energy producers to supply power to the grid with, at least 70 per cent forecasting accuracy from January 1. The Central Electricity Regulatory Commission (CERC) recently postponed enforcing the rule after it received a request from the Indian Wind Turbine Manufacturers Association in Chennai. The association said it is studying two 50 MW wind farms, one in Tamil Nadu and the other in Karnataka, to gauge how accurately wind farms can forecast. However, if wind energy producers fail to fairly forecast their production, they will have to pay unscheduled- interchange (UI) charges, from January 1, 2012. As of now, there is no such penalty on wind energy producers for unpredictable power supply, which is meant to be an incentive to investors in the renewable energy sector. The UI charges are borne by state power distribution utilities as they have to buy electricity at a higher price to meet the demand-supply gap at the last minute, said Minaxi Garg, deputy general manager of the National Load Despatch Centre, Delhi. 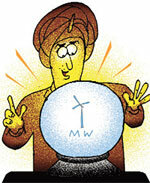 Maharashtra, for example, has one of the largest wind energy installations in the country, totalling 2,100 MW. In the fiscal year 2008-09, the state electricity distribution company had to pay over Rs 200 crore to buy unscheduled 700 million units, which is about 1 per cent of the total energy required. This shortfall could partly be due to irregular supply from wind energy companies. States are apprehensive about promoting renewable energy as it renders power grids vulnerable, leading to losses for the state, said Pankaj Batra, chief (engineering) of CERC. The amendments to IEGC regulations has also proposed setting up Renewable Regulatory Fund, which will help distribute the losses incurred due to variable wind power generation up to 30 per cent among all states. States with large share of wind energy installation will share the maximum financial burden.